How are you going with your resolutions? It’s seven days into the new year, and if you’ve made New Year’s resolutions I’d like to bet that it’s around now that your resolve is starting to fade… Don’t worry, I’m not going to nag! I am going to point out just how difficult it is to stick with a resolution, goal, action, new habit – whatever you call it. And take a moment, if you’re a health professional. Just stop for a moment and think about the resolution, goal, action, new habit you’ve just set with your last patient. What are the chances that person will stick with that goal for the week? Add in the complexities of, perhaps, competing goals or actions set by other clinicians seeing that person concurrently. The thought records, or mindfulness practice, or the planning and prioritising and pacing. Add in the usual daily life activities that need doing: the washing, cooking, shopping for groceries, paying the bills, filling the car with gas, spending time with family (not just any old time, but quality time). And work. And remembering to take medications (even the ones that make you feel drowsy or nauseous). And not sleeping, finding it hard to rest because pain gets in the way. And guilt perhaps because why is this person not getting better? Is it any wonder that the people we try to help seem “unmotivated”? Or that they appear not to be “adherent”? I keep coming back to something that bothers me about our attitudes towards the people we try to help. There continues to be a sense of “them” and “us”, with “us” being all that is good, proper and right, and “them” being, because we’re humans who like dichotomies, the opposite. After all “they” are seeking help from “us” which automatically puts “us” in the authoritative position. Now before I get harangued by people saying “oh but not me”, I wonder what it would be like to record yourself in conversation with your colleagues. You know the time at your breaks where you meet around the water cooler or the coffee pot, and you do a mutual moan about work. Check in with your discussion: how do you refer to the struggles of the people you see? Is there a chance, even inadvertently, to use a “should” or “must” word or two? Do you ever think not just about the things you do with the person you’re working with, but the things other clinicians are also doing? Enough finger pointing. What can we do to (a) shift our own attitudes and (b) help the people we see stick to the things we hope will help them? It’s a tough one. Shifting an attitude is difficult, in part because we don’t recognise we hold attitudes because they seem “normal” or commonplace – and the more ingrained or deep-seated they are, the more difficult it is for us to see them. Attitudes are complex – possibly partly based on memory and partly generated in the moment-in-time (Albarracin & Shavitt, 2018). They also change with difficulty – being in contact with “others”, for example, has been shown to influence attitudes positively, while even imagining positive contact showed about 14% of participants were more likely to explicitly state positive attitudes (Miles & Crisp, 2014). Overall, changes in attitudes based on an intervention or a message seems to have a small effect (d = 0.22) – but these seem to be quite durable changes. But something affect our attitudes: if we argue for our beliefs, we’re likely to become more stuck in our original beliefs, we add new information to our explanations but don’t readily throw out old information. To shift attitudes, new information needs to provide a “causal alternative” to explain our mental models. Values – linking specific actions to important values helps us to shift our attitudes. For example, we could begin to value why we started to work in health: was it job security? desire to help people? because people are constantly changing and different and it’s an exciting intellectual challenge? Whatever the value, we can begin altering the way we act towards the people we see to embrace the similarities between “them” and “us. Goals – we all vary in the level of general action we’re in. We range from being focused and both moving and thinking quickly to being completely inactive (such as when we’re asleep and not dreaming). Research has shown that if we want people to consider a new attitude, we need to frame this in the context of “being active” (Albarracin & Handley, 2011). Perhaps we need to think of the active part we play in pain rehabilitation – and consider the effects of our attitudes accordingly. Language – metaphors are persuasive, and seem to affect the way our attitudes are formed as well as what we do about them. Metaphors provide a way for us to become more psychologically distant from a concept, or more aware of complex psychological constructs. We can use metaphors when we think about how we want to work with people: are we ‘advisors’ or ‘coaches’ or ‘instructors’? Do we work collaboratively – or do we expect obedience? Do we have a partnership, or do we “direct” treatment? There have been mountains of research papers on behaviour change within a rehabilitation context. We’ve all been drilled on the idea of SMART goals (whatever the SMART acronym is meant to stand for!). We are exhorted to “set goals” from the first visit, and in some situations (New Zealand’s ACC rehabilitation process for example) obligates us to “set goals” which then provide a marker for whether treatment has been successful or not. Problem is, as Gardner, Refshauge, McAuley, Hubsher, Goodall & Smith (2018) found, we tend to set goals that we want, in collaboration with the people we’re working with, yes, but not necessarily the goals the person wants. In fact, their study showed that the treatment orientation of the clinician (all physiotherapists in this instance) predicted the degree of involvement from the person, with those therapists holding a stronger biomedical model being less likely to incorporate the person’s own goals. Now here I’m going to put some of my clinical experience to work rather than focusing on research, though I hope that what I’m suggesting ties into researched ideas! Locke and Latham (1990) are the godfathers of formal goal setting theory, albeit mainly in an organisational development context, however they have provided much of the information we use when working with the people seeking our help. If you’re looking for more information on goal setting, you should probably begin with their material. Begin with the end in mind. What does the person want to be able to do? Be wary of goals incorporating things no-one can completely control, such as “be able to win a race” – because someone else, on that day, may be faster that this person. Similarly, I’m wary of goals that talk about “pain-free” or “without flare-up” because we’re not always going to achieve this. Don’t forget to ask the person about what they want!! They probably don’t care too much about a 5 degree improvement in knee flexion – what they want to be able to do is go up and down stairs. Check out importance and particularly confidence when it comes to goals. A goal that’s unimportant will likely fall out of someone’s brain because it doesn’t matter. A goal that’s too challenging will equally be avoided (often not on purpose but because we don’t really like thinking about things we fear we’ll fail at). If the goal isn’t important – tap into values and why it might matter to the person. Change the goal if the person can’t come up with a compelling (ie emotionally resonant) reason to do it. Build confidence by scaffolding support around the person – how can you make it so that the person feels they can be successful? Begin with their ideas first so you build on their sense of self-efficacy. Generate actions to do rather than goals to achieve. Actions are done or not done. Dichomotous. Goals may or may not be achieved depending on a whole bunch of factors. Make the things the person needs to do simple and yes/no. Reminders or cues help. It’s easy to forget to do your pelvic floor exercises after birth, right? But a whole lot easier to remember when they’re tied into every time you use the toilet! Tie the action to an existing habit like when you’re waiting for the jug to boil, you can do your mindfulness. When you’re cleaning your teeth is a good time to do some squats (try it!). Use a cellphone appointment reminder. Record when the action is done. Set a specific time of day – ahead of time. Tracking actions helps keep on track. Graphs are great! Seeing your progress is reinforcing. But make this process easy – can it be done on the phone? Can it be recorded in a simple notebook? Check up on progress often. Problem solve when things don’t go the way you hope. Have days off. Absolute goals that are very specific and must happen every single day are likely to fail, and then we fall into the “what the hell” effect – oh I didn’t do X, so what the hell I might as well not do anything. I recommend for daily actions, that we have two days a week where they don’t need to happen. You might want to plan for five walking sessions, and do them all in the first five days – and then have two days off for good behaviour, or even decide you’re on a roll, and do two extra days. Whatever, the person wins because they’ve achieved the original action. There is no doubt that changing habits is tough. It’s even tougher when there are a lot of changes to implement. And even tougher still when the therapist sits in judgement of the person who is trying to juggle everything while not being at full capacity. I wonder if we as therapists could begin to view our work with people as a truly collaborative affair, where we recognise the incredible challenges the people we see are dealing with. Maybe our New Year’s Resolution could be “how to be a better therapist”. Gardner, T., Refshauge, K., McAuley, J., Hübscher, M., Goodall, S., & Smith, L. (2018). Goal setting practice in chronic low back pain. What is current practice and is it affected by beliefs and attitudes? Physiotherapy Theory and Practice, 1-11. Locke, E. A., & Latham, G. P. (1990). A theory of goal setting & task performance: Prentice-Hall, Inc.
What difference does it make to know about psychosocial risk factors? The “psychosocial yellow flags” or risk factors for developing ongoing disability after a bout of acute low back pain have been promulgated in New Zealand since 1997. Introduced as part of the Acute Low Back Pain Guidelines, the yellow flags were lauded both locally and internationally and subsequently there have been many international guidelines which have adopted this kind of integration. But what exactly do we do with that information? How does it help if we find out that someone is really afraid their pain means something awful, or if they fear their life will never be the same again, or if they truly worry about doing movements that provoke their pain? Truth to tell, although there have been a lot of studies examining the relevance of psychosocial risk factors, the uptake among clinicians has been fairly abysmal. This is particularly so among clinicians who work either mainly with acute musculoskeletal pain, or amongst those who are mainly involved in treated the body. One physio I know said she got the impression during her training that psychosocial factors “are the things we can blame when our treatments don’t work”. I think part of the problem is the focus on assessment “technology”. There is a proliferation of questionnaires that can be used to help spot the person who’s likely to have difficulty recovering. We have STartBack, Orebro Musculoskeletal Questionnaire, Pain Catastrophising Scale, Tampa Scale of Kinesiophobia, Depression Anxiety Stress Scale, Pain Self Efficacy Scale – most of which are known by their abbreviations, so it’s like an alphabet soup! But despite knowing about these questionnaires, and perhaps even administering them to people we think might need assessment, once the results come in it’s pretty difficult to know what to do next. So what if a person reports really high levels of catastrophising? Or that they’re very high on the Fear of Injury/Reinjury on the TSK? Or that they have the lowest ever score on the PSEQ? What on earth do you do to make an impact? Some people are very actively engaged in “Pain Education”. It’s given to absolutely everyone because “the evidence says” it “works”. Pain reduces. People get engaged in their exercise. Life returns to normal. Some people refer immediately on to a psychologist. Let them deal with the “difficult” patients. Others just carry on as normal but in the back of their mind have the “out” that “Oh but they have yellow flags” – and drop their expectations accordingly. To me that’s just not good enough, and it suggests to me that we need to learn more about what these measures mean – and what to do differently as a result. How do we choose who to give a questionnaire to? – do we rely on “intuition” or do we give them out to everyone? How much do we rely on strong RCT’s examining whole treatment packages, versus how much do we rely on principles of behaviour change and knowledge of the underlying theories relevant to pain and disability? What if our clinical reasoning models are completely silent on the work involved in supporting people who present with these risk factors – what if our clinical reasoning models suggest that this work is not all that important compared with the “real” work of tissues and muscles and movement? Here are my thoughts on what we can do. I think we should give screening questionnaires to everyone who comes in with an acute bout of musculoskeletal pain, and I think there are a couple that really work well – Orebro is clearly one of them, PCS or PASS are both useful, and I think it’s helpful to screen for mood problems. Why do I think everyone needs these? Well, it’s easier to give them to everyone than to rely on our terribly inaccurate intuition. The risk of failing to identify someone who needs more support is high (and the consequences of omitting this is serious). By routinely administering screening measures we can de-stigmatise the process (though there shouldn’t be any stigma associated with understanding that pain involves the whole person!). We can make the administration easy by integrating it within routine clinic entry process – and by using electronic forms of each questionnaire we can make entering and scoring them easy. We then need to learn what the questionnaires actually measure – not just the total score, but the subscales as well. Then we need to use those subscale scores to understand what we need to ask the person when we see them face-to-face. This helps us begin to understand the person and how they came to develop these beliefs and attitudes, and in doing so we can develop greater empathy for their experience – and alter our treatments to reflect their needs. For management, I think we have to, at this stage, step beyond the RCT for evidence. There’s a few reasons for this: one is that RCTs naturally omit individual responses to the treatment meaning we lost the detail as to who responds to which aspect of the treatment. Another is that RCTs often group patients together to ensure power is reached – but in doing this, omit important individual differences. And finally, each person we see is a unique individual with a unique interaction between the various factors influencing their presentation – and there are simply insufficient RCTs to account for these differences. Does this mean we stop using evidence? Oh no!! It just means we need to look at the principles behind many treatments – what are the guiding principles and why might they apply to this person at this time? Finally we need to monitor outcomes so we can establish whether our approach actually helped. Finally, I think our clinical reasoning models need to include important aspects of treatment that we vary, often without being aware that we do. For example, if we see someone who scores very high on the PCS and tends to ruminate or brood on the negative, we can’t go ahead and give that person the same set of exercises or activities we’d give someone who is quite confident. We’ll need to lower the physical demands, give really good explanations, take the time to explain and de-threaten various sensations the person may experience, we’ll probably need to move slowly through the progressions, and we’ll definitely need to take time to debrief and track progress. These “invisible” aspects of treatment are, I think, often the most important parts – but they’re often not mentioned in clinical protocols, and perhaps our skill in titrating the challenges we give our patients is not well developed. These factors incorporate psychological techniques of behaviour change – things like reinforcement, motivational interviewing, problem solving, Socratic questioning, how to fade support, how to bolster confidence, how to vary the environment, and how to avoid pliance and tracking (or going along with things rather than truly integrating the learning). If we want to work with people and help them change their lives, we need to learn how people change behaviour. That means, I’m afraid, learning some psychology…! What do we do with those questionnaires? Courtesy of many influences in pain management practice, you’d have to have been hiding under a rock or maybe be some sort of dinosaur not to have noticed the increasing emphasis on using questionnaires to measure factors such as pain catastrophising, depression or avoidance. The problem is I’m not sure we’ve all been certain about what to do with the results. It’s not uncommon for me to hear people saying “Oh but once I see psychosocial factors there, I just refer on”, or “they’re useful when the person’s not responding to my treatment, but otherwise…”, “we use them for outcome measures, but they’re not much use for my treatment planning”. 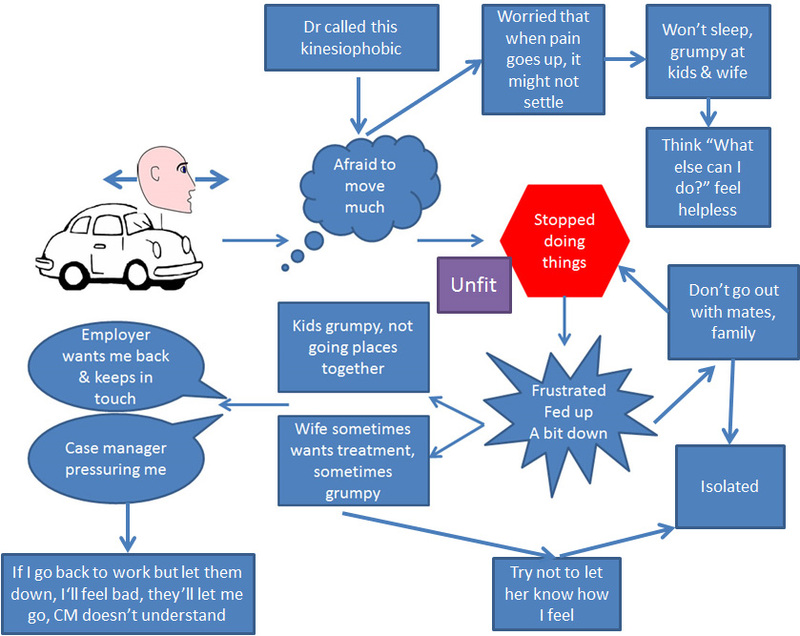 Today I thought I’d deconstruct the Pain Catastrophising Scale and show what it really means in clinical practice. The Pain Catastrophising Scale is a well-known and very useful measure of an individual’s tendency to “think the worst” when they’re considering their pain. Catastrophising is defined as “an exaggerated negative mental set brought to bear during actual or anticipated painful experience” (Sullivan et al., 2001). The questionnaire was first developed by Sullivan, Bishop and Pivik in 1995, and the full copy including an extensive manual is available here. Keep returning to that page because updates are made frequently, providing more information about the utility of the measure. The questionnaire itself is a 13-item measure using a 0 – 4 Likert-type scale from 0 = “not at all” to 4 = “all the time”. Respondents are instructed to “indicate the degree to which you have these thoughts and feelings when you are experiencing pain”. There are three subscales measuring three major dimensions of catastrophising: rumination “I can’t stop thinking about how much it hurts”; magnification “I worry that something serious may happen”; and helplessness “It’s awful and I feel that it overwhelms me”. There’s not a lot of point in having numbers without knowing what they mean, so the manual provides means and standard deviations relating to a population individuals with injury leading to lost time from work in Nova Scotia, Canada. Clinicians are typically interested in whether the person sitting in front of them is likely to have trouble managing their pain, so the manual also provides “cut off”scores for what could be described as “clinically relevant” levels of catastrophising. A total score of 30 or more is thought to represent the 75th percentile of scores obtained by individuals with chronic pain. Cutting to the chase, the question is “so what”? What difference will getting this information from someone make to my clinical reasoning? Leaving aside the enormous body of literature showing a relationship between high levels of catastrophising and generally poor responses to traditional treatments that address pain alone (including surgery for major joint replacement, recovery from multiple orthopaedic trauma, low back pain, shoulder pain etc), I think it’s helpful to dig down into what the three subscales tell us about the person we’re working with. It’s once we understand these tendencies that we can begin to work out how our approach with someone who has high levels of rumination might differ from what we’ll do when working with someone who has high levels of helplessness. As an aside and being upfront, I think it’s important to remember that a questionnaire score will only tell you what a person wants you to know. Questionnaires are NOT X-rays of the mind! They’re just convenient ways to ask the same questions more than once, to collect the answers and compare what this person says with the responses from a whole lot of other people, and they allow us to organise information in a way that we might not think to do otherwise. I also think it’s really important NOT to label a person as “a catastrophiser” as if this is a choice the person has made. People will have all sorts of reasons for tending to think the way they do, and judging someone is unprofessional and unethical. Rumination is that thing we do when a thought just won’t get out of our mind. You know the one – the ear worm, the endless round and round, especially at night, when we can’t get our mind off the things we’re worrying about. If a person has trouble with being able to drag his or her attention away, there are some useful things we can suggest. One theory about rumination is that it’s there as a sort of problem solving strategy, but one that has gone haywire. Mindfulness can help so that people can notice their thoughts but not get hooked up into them. I like to use this both as a thought strategy, but also as a way of scanning the body and just noticing not only where the pain is experienced, but also where it is not. “Fifteen minutes of worry” can also help – setting aside one specific time of the day (I like 7.00pm – 7.15pm) where you have to write down everything you’re worried about for a whole fifteen minutes without stopping. By also telling yourself throughout the day “I’m not worrying about this until tonight” and afterwards saying “I’ve already worried about this so I don’t need to right now”, worrying and ruminating can be contained. By being present with the thoughts during that 15 minutes, the threat value of the thought content is also reduced. This is the tendency to think of the worst possible thing rather than the most likely outcome, and it’s common! Magnification can really increase the distress and “freeze” response to a situation. If a person is thinking of all the worst possible outcomes it’s really hard for them to focus on what is actually happening in the here and now. There’s some adaptive features to magnification – if I’ve prepared for the worst, and it doesn’t happen, then I’m in a good situation to go on, but in some people this process becomes so overwhelming that their ability to plan is stopped in its tracks. Once again, mindfulness can be really useful here, particularly paying attention to what is actually happening in the here and now, rather than what might happen or what has happened. Mindful attention to breathing, body and thoughts can help reduce the “freeze” response, and allow some space for problem solving. Of course, accurate information presented in nonthreatening terms and in ways the person can process is important to de-threaten the experience of pain. This is at the heart of “explain pain” approaches – and it’s useful. What’s important, however, is to directly address the main concern of the person – and it may not be the pain itself, but the beliefs about what pain will mean in terms of being a good parent, holding down a job, maintaining intimacy, being responsible and reliable. It’s crucial to find out what the person is really concerned about – and then ensure your “reassurance” is really reassuring. Helplessness is that feeling of “there’s nothing I can do to avoid this awful outcome so I won’t do anything”. It’s a precursor to feelings of depression and certainly part of feeling overwhelmed and out of control. When a person is feeling helpless it’s important to help them regain a sense of self efficacy, or confidence that they CAN do something to help themselves, to exert some sort of control over their situation. It might be tempting to aim for focusing on pain intensity and helping them gain control over pain intensity, but because it’s often so variable and influenced by numerous factors, it might be more useful to help the person achieve some small goals that are definitely achievable. I often begin with breathing because it’s a foundation for mindfulness, relaxation and has a direct influence over physiological arousal. You might also begin with some exercise or daily activities that are well within the capabilities of the person you’re seeing. I like walking as a first step (no pun intended) because it doesn’t require any equipment, it’s something we all do, and it can be readily titrated to add difficulty. It’s also something that can be generalised into so many different environments. In a physiotherapy situation I’d like to see PTs consider exercises as their medium for helping a person experience a sense of achievement, of control, rather than a means to an end (ie to “fix” some sort of deficit). Questionnaires don’t add value until they’re USED. I think it’s unethical to administer a questionnaire without knowing what it means, without using the results, and without integrating the results into clinical reasoning. The problem is that so many questionnaires are based on psychological models and these haven’t been integrated into physiotherapy or occupational therapy clinical reasoning models. Maybe it’s time to work out how do this? Sullivan M J L, Bishop S, Pivik J. The Pain Catastrophizing Scale: Development and validation. Psychol Assess 1995, 7: 524-532. We all know that having pain can act as a disincentive to doing things. What’s less clear is how, when a person is in chronic pain, life can continue. After all, life doesn’t stop just because pain is a daily companion. I’ve been interested in how people maintain living well despite their pain, because I think if we can work this out, some of the ongoing distress and despair experienced by people living with pain might be alleviated (while we wait for cures to appear). The problem with studying daily life is that it’s complicated. What happened yesterday can influence what we do today. How well we sleep can make a difference to pain and fatigue. Over time, these changes influences can blur and for people living with pain it begins to be difficult to work out which came first: the pain, or the life disruption. Sophisticated mathematical procedures can now be used to model the effects of variations in individual’s experiences on factors that are important to an overall group. For example, if we track pain, fatigue and goals in a group of people, we can see that each person’s responses vary around their own personal “normal”. If we then add some additional factors, let’s say pain acceptance, or catastrophising, and look to see firstly how each individual’s “normal” varies with their own acceptance or catastrophising, then look at how overall grouped norms vary with these factors while controlling for the violation of usual assumptions in this kind of statistical analysis (like independence of each sample, for example), we can begin to examine the ways that pain, or goal pursuit vary depending on acceptance or catastrophising across time. In the study I’m looking at today, this kind of multilevel modelling was used to examine the variability between pain intensity and positive and negative feelings and pain interference with goal pursuit and progress, as well as looking to see whether pain acceptance or catastrophising mediated the same outcomes. The researchers found that pain intensity interfered with goal progress, but it didn’t do this directly. Instead, it did this via the individual’s perception of how much pain interfered with goal pursuit. In other words, when a person thinks that pain gets in the way of them doing things, this happens when they experience higher pain intensity that makes them feel that it’s hard to keep going with goals. Even if people feel OK in themselves, pain intensity makes it feel like it’s much harder to keep going. But, what’s really interesting about this study is that pain acceptance exerts an independent influence on the strength of this relationship, far more than pain catastrophising (or thinking the worst). What this means is that even if pain intensity gets in the way of wanting to do things, people who accept their pain as part of themselves are more able to keep going. The authors of this study point out that “not all individuals experience pain’s interference with goal pursuit to the same extent because interference is likely to depend on pain attitudes” (Mun, Karoly & Okun, 2015), and accepting pain seems to be one of the important factors that allow people to keep going. Catastrophising, as measured in this study, didn’t feature as a moderator, which is quite unusual, and the authors suggest that perhaps their using “trait” catastrophising instead of “state” catastrophising might have fuzzed this relationship, and that both forms of catastrophising should be measured in future. An important point when interpreting this study: acceptance does not mean “OMG I’m just going to ignore my pain” or “OMG I’m just going to distract myself”. Instead, acceptance means reducing unhelpful brooding on pain, or trying to control pain (which just doesn’t really work, does it). Acceptance also means “I’m going to get on with what makes me feel like me” even if my pain goes up because I do. The authors suggest that acceptance might reduce pain’s disruptive influence on cognitive processes, meaning there’s more brain space to focus on moving towards important goals. In addition to the cool finding that acceptance influences how much pain interferes with moving towards important goals, this study also found that being positive, or feeling good also reduced pain interference. Now this is really cool because I’ve been arguing that having fun is one of the first things that people living with chronic pain lose. And it’s rarely, if ever, included in pain management or rehabilitation approaches. Maybe it’s time to recognise that people doing important and fun things that they value might actually be a motivating approach that could instill confidence and “stickability” when developing rehabilitation programmes. Oh how true is that. And any health professional will tell you that there’s just no point pushing for change when the person isn’t ready for it. So often we encounter people who are unhappy with their lot in life, struggling with this and that, and yet they just don’t make changes that seemingly sit right in front of their faces. It’s SO frustrating! Or, in my case, it used to be so frustrating – because a few years ago I discovered an approach that revolutionised my practice and made me take another look at my expectations and beliefs about motivation. More about that shortly. This paper outlines several theoretical approaches that have given health professionals some powerful tools to use when working with people who could change but haven’t. In order to help people in this space, the authors argue that we really need to understand why it is they don’t have “motivation”. So, what is motivation? Simply put, it’s the desire to do things. And for many of us, we think of it as a “thing” that you either have, or you haven’t. But motivation is a tricky thing – ever been disinclined to go visit someone who’s invited you to dinner, dragged yourself there and then had a fantastic time? Or had one of those ideas that flash through your mind, get all excited about it … but never get around to it? Motivation is a fluid thing and doesn’t always equate to action! Amotivation, or lacking in motivation, is quite specific to a particular action or set of actions. It may be because a person doesn’t think he or she will be successful if they try. Why bother if you know you’re going to fail? This is about having low self-efficacy, or low confidence and thinking it’s not possible to obtain skills or capabilities to be successful. Amotivation can also occur if a person thinks it’s going to take more out of them than the rewards from doing it. The costs outweigh the benefits. And it can occur when the effort needed to overcome barriers or to push through feels too much, or the change just doesn’t seem worth it because it’s not that big a deal. Here’s where I come back to my revolution a few years ago – I found that by using motivational interviewing, I was able to shift the responsibility for making a decision to change back to the person (instead of trying to “make it” happen), but at the same time, recognising the reasons for the person staying where they were. To me, it boils down to respecting that people don’t do dumb stuff for fun. There’s usually very good reasons for them having made a decision, either to make a change, or NOT to make a change. What they’re currently doing works, at least to a certain extent. Using motivational interviewing, the first and most important thing to learn is to respect the person and take the time to understand the good things they recognise about their current situation. Because there are always some good things about being stuck – it’s easier, for one, than making a change. It’s familiar. It’s worked once or twice. People know what to expect. Change always means disruption somewhere, and that’s not comfortable or easy. If we look at the reasons I outlined for NOT making a change, and work through them, I think (and so do the authors of this paper!) that there are some things we can do to make change less difficult, and in so doing, build momentum for change. Lack of self-efficacy – if someone doesn’t think he or she will succeed, why would they even begin? Personally I think this is a big part of “lack of motivation for returning to work” which is something I’ve seen written in way too many clinical reports. If someone doesn’t think they’ll be successful, how could we make the change less challenging? Increase support? Make the steps smaller? Look at other things the person has been successful in? Find out how they’ve made changes successfully in the past and use that? Not valued highly – or, something else is more valued than this right now. Respecting that there is a time and place for things to be done, and that other things in life can over-ride making changes is both authentic and human. It means that this change isn’t yet important enough – so, how do you build importance? To me, importance is about values and what a person wants in his or her life. There are often discrepancies between what we want and what we’re doing, and sometimes this is because it’s too difficult or messy to think about it. I think part of our job as health professionals of any discipline is to help people consider things that are tough. To reflect on the short and long-term outcomes of carrying on in status quo, and the same if we made a successful change. Things we do because they’re more comfortable in the short-term can be incompatible with what we really want long-term. It’s part of my job to help people think about this. NOT, I hasten to add, to “make” them decide in any particular direction. That’s not my job, I’m there to help people think about how their actions today might affect the future, and let them make their own decisions. At the same time, I can choose to reflect the reality of the long-term effects of today’s actions. That’s being responsible as a health professional. Feeling the end result isn’t worth it, or that there are too many things in the way – again, to me this feels a lot like addressing self-efficacy. If there are things in the way, or it feels too hard, then part of my job is to help the person find a way that is within their capabilities, and to grab a vision of what it might feel like to have successfully achieved that end result. Asking the person to “look forward” to a few months, years down the track – what would it look like if they made a change that worked? How would this affect what’s important to you? If you decided not to make a change, what would things be like? Would that be what you want? Habits making it hard to think about changing – It’s easy to over-indulge on chocolate when there’s one of those “treat boxes” in the workplace. It’s easy to go home and stay at home rather than go for a run if you don’t have running shoes and a change of clothes in your car. Environmental triggers where it’s easier NOT to do a healthy thing make it difficult for someone who’s just not even thought about making a change. Employers, healthcare facilities and both local and central government can make it harder for people to do unhealthy things simply by structuring when and where people can access them. So the carpark a little further from the workplace can make it easier to get more exercise each day, banning smoking from healthcare facility grounds makes it harder to get a smoke break, having healthy options in the “treat box” can make it easier to choose something healthy. This set of changes can feel a bit “nanny state”, but they’re effective and useful when it’s those simple little changes that make the difference between living well, or not. Last week I introduced you to one way I use to develop a shared understanding of the many factors influencing how and why a person seeks help for their pain. The person and I work together to understand his or her perspective. I use a range of open-ended questions and reflective listening to guide our discovery of how his/her pain affects life and emotions. I don’t try to give explanations at this point – explanations will influence what the person says to me, and may inadvertently shape or change what he or she says without necessarily changing his or her beliefs. I’m not trying to make any diagnoses either. A diagnosis is just a short-hand way of lumping a bunch of symptoms together. Great for research, and great for when we have a clear treatment, but a diagnosis tells us nothing about how the problem is affecting this person at this time. And in pain we’re always looking at the person and his or her experience, because even if we successfully get rid of the pain, the person will have learned something through the experience and this will influence the person in the future. I’m informed by what we know about pain from research, so I’m constantly probing and looking for the relationships between factors we know will affect the person. Note that I’m not looking for tissue-level influences, but rather I’m investigating at a “person” level. This means I’m looking at psychological and sociological processes. I’m not ignoring those tissue-level factors, but I’m placing those off to one side for the moment. There are a couple of reasons for this: the first is that I’m probably not going to directly influence tissue-level factors. I don’t lay hands on people. I don’t give drugs. The second is that the person isn’t likely to be aware of those factors. They know much of their own experience (not all – but we’ll come to that), and experience and perception are the most potent drivers of what a person believes and therefore does. I try wherever possible to flesh out my interview with additional information. This might be from questionnaires, or observing, or clinical notes from other people. And yes, I incorporate this information with the full knowledge of the person – in fact, they’re part of the process of integrating this information. This diagram is a pretty simple one, when you think of all the factors that could be involved – and in this case, I’ve made it much clearer than my usual scribble! At this point I have a series of hypotheses to explain why Gerald is in this state. Together with Gerald, we’ve established that there could be some fear of pain, and in particular, fear that Gerald won’t be able to cope if his pain goes up and doesn’t settle. Gerald has also identified that he can feel helpless at these times, because he doesn’t know what else to do to manage his pain. He believes he’s getting unfit, and that’s adding to his feelings of frustration. He doesn’t want to go out with his mates because he’s irritable. He tries not to let his wife know how he’s feeling to protect her, but this adds to him feeling isolated. He doesn’t want to go back to work, not because he’s not motivated, but because he’s afraid he’ll let them down and this will add to his guilt. He doesn’t think his case manager understands this. I could ask Gerald to list his main concerns and use these as a guide for my treatment outcomes, but I’ve recently started using a different approach. I’ll ask Gerald what he would be doing differently if his pain wasn’t such a problem to him. Bronnie: Let’s imagine for a minute, what would you be doing differently if your pain wasn’t such a problem? Gerald: Well, I’d be back at work, for one thing. Bronnie: OK, and would you think you’d be back at work full time, or ease your way back in? Gerald: Well, I think it would be sensible to ease myself back in because it’s been a while and I’m out of shape. Better to know I can do it than have a go and fail. Bronnie: Great idea. What else would you be doing differently if your pain wasn’t such a problem? Gerald: I’d take my wife out for dinner, it’s been hard on her while I’m so laid up and grumpy. Bronnie: What’s your main concern about going out to dinner with your wife right now? Gerald: I can’t sit long enough to enjoy a meal out. It all seems so hard, to get into a car, and drive to a restaurant, and sit there for three courses. I’m just too sore to do it. Bronnie: So going to a restaurant and sitting to get there and while you’re there is going to increase your pain? Gerald: Yeah. Is it worth it? What if it doesn’t settle? I can’t sleep and then the next day I’m shattered. I don’t think it’s worth it. Bronnie: OK. Is there anything else you’d be doing if your pain wasn’t such a problem for you? Gerald: I’d be going out and seeing my mates, going fishing and 4 wheel driving. I miss that. There’s no way I could do that right now. Bronnie: What’s your main concern about going fishing, and seeing your mates at the moment? Gerald: I’d be ready to go home before they’d even started. They’d get fed up with me slowing them down. And casting is really hard on my neck. Bronnie: So to sum up then, it seems like there are some things you’d love to be doing, but reasons you think it would be better not to be doing them right now. If we go through them, you’d love to go back to work, but you’d like to do it gradually so you can get in shape again, and so you know you’ll succeed. You’d love to take your wife out for dinner, but the whole dinner thing feels too hard, and you’re worried that your pain will get out of hand and you won’t be able to sleep. And you’d really love to get back out with your mates again, and go fishing, but right now you think your mates would get fed up with you because you’d want to leave too early, and you wouldn’t be able to cast without setting your pain off. Does that sound about right? Bronnie: I think there are some things we could begin to work on so you feel more confident you can handle it when your pain levels go up and down. And I think we could work on some physical things that could help you feel a bit fitter, more able to do things for longer. And finally, I think it would be great if we could help you and your wife connect a bit more, perhaps not yet at a sit-down restaurant, but perhaps there are other ways this could happen. What are your thoughts? Is there anything you’d especially like to look at? What I’ve tried to do here is identify the underlying reasons Gerald isn’t doing things. While pain appears to be the problem, it’s not the pain it self but the fear of possible effects of pain that haven’t even happened yet that are really stopping him from doing things. And this is adding to the misery of having neck pain. By giving Gerald the chance to tell me his dreams, we’re going beyond “I need to get rid of my pain” and into the reasons for living in the first place. People don’t just live to get rid of pain, they live to have lives full of meaning, let’s not ever forget that. I dislike that acronym “SMART” goals. I can never decide whether it’s meant to mean “Specific, measurable, achievable, realistic and time-bound” or “specific, manageable, active, realistic and timed” And if it’s either of those, what’s the difference between achievable and realistic? Or is it meant to be “relevant”? In previous posts I’ve established good reasons to have a focus for therapy. Unless the focus is something valued by the client, it’s either unlikely to get done or it’s not their goal and they’re going along with it to keep you happy. Goals, targets or focus are useful, and the logic goes that unless you have them you won’t know where you’re going or when you’ve got there. I’m not going to argue against the idea of having a focus to therapy. I just think there are risks in having goals, like some sort of checklist that says “If you achieve this, you’re all good”. Seriously, that doesn’t work in real life. That’s the same kind of logic that says “if I just buy enough things I’ll be happy”, “if I just earn a bit more I’ll be happy”. While there’s a bottom line below which it’s hard to think beyond survival, above that line, having stuff, and even doing things as an end in themselves doesn’t fulfill for long. What gives forward momentum, enrichment, fulfillment and can’t be ticked off like some shopping list is recognising that life is actually a whole series of actions and events that, when we think back on them, make up a good life. The richer events and experiences and actions feel good and fulfilling. The empty routine and humdrum things feel deadly dull and empty. When I think about the purpose of therapy my focus is helping people to live the kind of life they value, doing the things they believe are important. Given I don’t want to be a long-term feature in a client’s life (for all I love them, I’d rather they were doing it themselves), my focus is on helping them work out what makes a rich, fulfilled life they can look back on and feel satisfied. My job is to help them develop skills and strategies to carry out the actions needed to live a life aligned with what they value. Let me unpack this a little. Many people I see place value on being a good parent, a loving partner, a reliable employee. When I see them, their pain has interfered with doing the things they believe demonstrate “being a good parent” or “being reliable”. Pain has moved in to their lives, and come and sat on their laps right in front of their face so that all they can see is pain. If I ask someone in this state to “set goals” they laugh, rather sarcastically sometimes, and say they don’t have goals, they can’t think of anything and what’s the point anyway. Perhaps not in those words, but the meaning is clear. Instead, I ask them “what would you be doing if your pain was less of a problem for you?” Sometimes I’ll even hand over a plastic fairy wand I have, and suggest they dream a little. It’s then that the passion takes over – they’ll say “I’d be out working, having fun with my friends, caring for my family” – and the list goes on! If I stopped there, though, I’d be holding a tantalising dream just out of reach, which is cruel, so I don’t. Instead I ask why these things are important. That’s how I find out that “family is everything”, “I just love creating”, “I need my friends”. The reason for this tactic is to help generate what Acceptance and Commitment therapists (ACT) call “creative hopelessness“. Because motivation to change comes from inside – that it’s important enough, and the person is confident that change can happen. What would happen if you made a little room for pain to be there while you’re doing things that contribute to you being the kind of parent you want to be? What I mean by this last statement is that pain can interfere with doing that things that help you feel you’re being a good parent. And that can lead to either completely abandoning those activities, or doing them while clutching resentfully to “the pain that interferes”. What if you attended to the value or importance of being the kind of person who is a good parent instead of focusing on the irritation, frustration and anger of having to bring pain along for the ride? For many people, the things they believe contribute to “being a good parent” far exceed what they can currently achieve. So they give up and get demoralised. They both have their pain AND they don’t manage the very things they most value. Now it’s here that I could begin to “set goals” and suggest we work towards them using all the traditional elements of goal setting. And that probably has excellent value. But here’s the catch: often we hold very strong internal rules about how these things should be done so that unless we can do them exactly the way we think they should be done, we’re not satisfied. And for many people this fails to recognise that as time goes on, life too goes on, and we change the way we do things to accommodate new habits or capabilities. So I try to begin a process of developing flexibility – and using the values a person identifies as a compass rather than a checklist. What would happen if we thought a little about the range of things people might do to convey “being a good parent”? Maybe it would mean going to the children’s sports games and being a spectator. Maybe it would mean making lunches, helping to do homework. Maybe it would include listening while a kid tells you about his or her day. Many of these things can be done with pain present. Many might require altering how they’re done to accommodate having pain present but provided that they express the underlying value of being a good parent, can be fulfilling. What’s important is less about the what a person does, and a whole lot more about why and how they do it. When “being a good parent” becomes the direction we live (because we can never tick the box that says “being a good parent” is complete), then we focus on why and how we do it. Attention goes away from “but pain stops me”, and towards discovering all the ways “being a good parent” can be lived. Often it’s through doing this that people seek new coping strategies so they can extend what they do. People may “set goals” or future actions they want to take but instead of feeling frustrated and dissatisfied, they begin to to take actions that bring them closer and closer to living the life they want to live. And that, my friends, is what I think “goal setting” is about. This festive season is a good time to consider what’s important in your life. What actions are you taking to live a value-filled life? Chronic pain has been called one of the “most powerful and insidious disruptors” of routine, habit and wellbeing (Karoly, Okun, Enders & Tennen, 2014). When a person experiences pain, a whole range of mechanisms come into play and work together to use thinking and processing space, and especially those areas we use when we’re developing and achieving goals. When people are first trying to make sense of their situation, they can find it hard to think about future goals and plans, and instead focus on trying to solve the problem of pain – many people call this time like being in limbo (McGowan, Luker, Creed & Chew-Graham, 2007). It’s not surprising, then, that when clinicians begin to work with someone who has had pain for a very long time, it can be very difficult for them to think of a “goal”. After all, not everyone sets goals anyway (I heard somewhere that it’s about 3% of people – but I can’t find the research to support it). But in pain management, funders often ask clinicians to work with the client to “set goals” for therapy from the first day as a way to ensure a client-centred programme, increase motivation, and monitor outcomes. This can be a problem in a couple of ways: first of all, if the person doesn’t have goals because they’ve been in “limbo land” for a long time, and feel pretty demoralised or their goal relates to “getting rid of the pain”; secondly, if the person has vague ideas that are difficult to set into the typical “SMART” formula (incidentally, I really don’t like that acronym! ); thirdly, if the person doesn’t have strong ideas about what they want from therapy, the clinician can set the goals for them, and perhaps not those the client is really all that interested in; and finally, it’s hard to set goals without having spent some time listening to and collaborating with the client. Pain can be experienced as a major obstacle to motivation for setting goals. Negative mood associated with pain can reduce motivation to think ahead, to dream. Morning pain in particular can make it more difficult to want to do things, unless those activities are important, there are relatively structured ways to pursue them, and they don’t need much planning. This can influence whether a person gets out of bed to go to work, or the gym, or take the kids to school. In a daily diary study, Karoly, Okun, Mooris, Enders and Tennen (2014) found that people with relatively high overall pain over a two-week period, but not necessarily just in the morning, and who have chosen to stay working, often also carry out their “lifestyle” goals in the afternoon. They suggest this could be because goals that are further out in time, and the positive feelings associated with achieving work goals keep them motivated. But they also found that even then, on the days people had more than their usual pain in the morning, they were less inclined to do as much. The implication of this finding by Karoly and colleagues is that people who experience a “high pain” morning might need some reminders of the pleasure they get when they achieve goals – perhaps to pay attending to people and places that support their goal achievement. Helping people develop goal planning skills might also be useful – do the thinking when you’re feeling a bit more positive and can see beyond “now”, then when pain is higher, the cognitive demanding work is already done and the reminders help to generate positive emotions to encourage doing them. OK, so we know some ways of helping people keep motivated, but what do we do to help people set them in the first place? These questions begin to identify activities in which a person might experience “flow” – Mihaly Czikszentmihalyi. Another way is to ask the person what they need to, or want to do, perhaps using the occupational therapy broad groups of “productivity/work”, “leisure/fun”, and “self care” as prompts. I’ve also found that by asking “what’s important in your life” can be a good way to generate personal goals. Importance indicates that the person places value on it. Values are important and lasting beliefs or ideals shared by people about what is good or bad and desirable or undesirable. Values underpin ACT (Acceptance and Commitment Therapy), because instead of setting goals, which can be achieved, values are like a compass – things we do (actions) allow us to move closer towards important values, and we never completely achieve them. They’re directional and aspirational, and allow us to do difficult things that have short-term negative consequences, just so we can move towards a better long-term consequence (van Huet, Innes & Stancliffe, 2013). How can you use this in therapy? Well, if a person really values family, and being a good Dad, anything that Dad does to enable him to be a better Dad will be motivational. So you can ask “What could you do today that would take you one step closer to being a great Dad?” And use whatever that might be as the foundation for a goal. Then you can go on and use all the other great goal-setting strategies like specific, measurable, achievable, relevant, and so on. This doesn’t mean that doing that thing will be easy – far from it! But it will make achieving it more relevant, powerful and motivating. Working with the challenges is why you are a therapist. Karoly, Paul, Okun, Morris A., Enders, Craig, & Tennen, Howard. (2014). Effects of Pain Intensity on Goal Schemas and Goal Pursuit: A Daily Diary Study. Health Psychology, 33(9), 968-976. McGowan, Linda, Luker, Karen, Creed, Francis, & Chew-Graham, Carolyn A. (2007). ‘How do you explain a pain that can’t be seen?’: The narratives of women with chronic pelvic pain and their disengagement with the diagnostic cycle. British Journal of Health Psychology, 12(2), 261-274.
van Huet, Helen, Innes, Ev, & Stancliffe, Roger. (2013). Occupational therapists perspectives of factors influencing chronic pain management. Australian Occupational Therapy Journal, 60(1), 56-65.